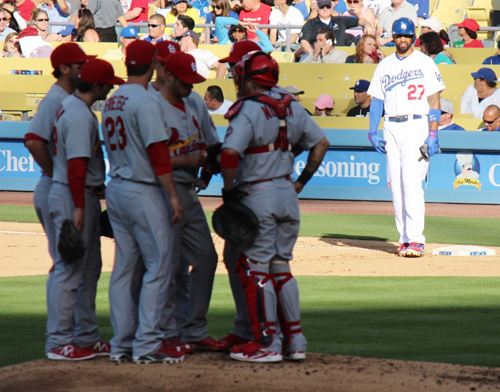 Rays of sunshine shine down on Matt Kemp during Dodgers win over the first place St. Louis Cardinals last weekend at Chavez Ravine. The Dodgers took the first two games in the freeway series against the Angels (8-7. 3-0), but lost (3-4) on Wednesday. Series continues tonight at 7pm. The Dodgers next travel to Colorado Friday for a 3 game series against the Rockies. The next home stand starts on June 2, when the Dodgers will take on the San Diego Padres.